The energy in the Sears Centre Arena was electric for the 2015 Secret U.S. Classic. Simone Biles of World Champions wowed the crowd the whole night through to win the gold with a 62.4. Gabby Douglas of Buckeye Gymnastics came out strong in her first US meet since 2012 for silver, earning a 60.50. Nichols showed she was out to make a name for herself with her new amanar, and gorgeous, consistent routines on every event for a 60.0. Bailie Key of Texas Dreams came out strong in her US senior debut, just missing the bronze with a 59.45. 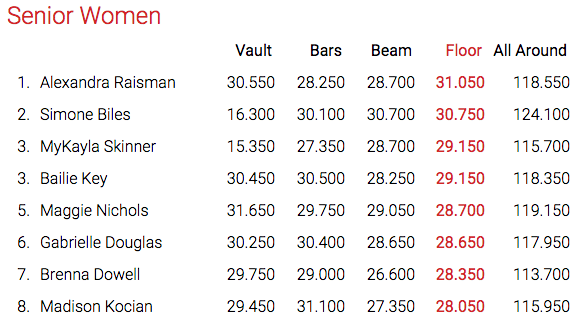 Raisman had a great night, competing her amanar for the first time, but fell on a newly upgraded floor pass, ending the night with a 59.05. Kyla Ross of Gym Max only competed on two events due to a hurt heel. Nichols performed her new amanar vault with just a slight step on landing. Douglas looked great on bars, the arena exploded before and after her routine with just a hush while she competed. She flew high on all her release moves for a 15.4. Key competed beam like the veteran she is in her first US senior meet, scoring a 14.45. Raisman pulled out a surprise amanar in warm ups and competed it beautifully, but with a step to the side that went out of bounds for a 15.4. The crowd went even wilder for Biles on beam, where she was solid on her new barani and front pike, and just had one major wobble for a 15.25. Brenna Dowell fell on a release after hitting her routines in podium training and warm ups in her first meet back as an elite. Alyssa Baumann fell on beam, but hit the rest of the routine with her normal gorgeous lines. Ashton Locklear is still getting back into routine condition, and though she performed on beam, she was not scored. Nichols started off the rotation with a gorgeous bar routine for a 14.95. Key opened up with a gorgeous double layout, and continued on with her fantastic new routine to score a 14.8. Douglas hit an awesome, perfectly solid beam routine for a 14.9. Raisman showed her ever improving bar routine, where she scored a 14.2. MyKayla Skinner debuted her new floor routine, but put her hands down on her last pass after looking very winded. Ross missed her hand in her new bhardwaj release and had to stop. Then she fell again. She got back up with determination to compete the rest of her routine while the crowd cheered her on, and she looked great. 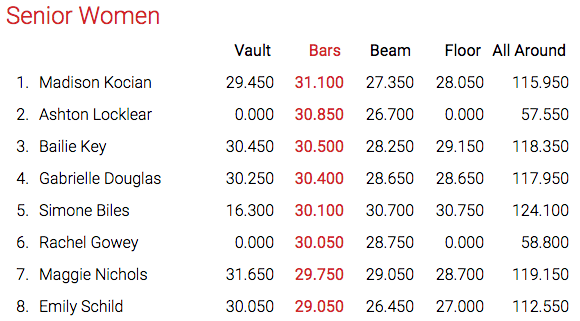 Biles led at the halfway point with a 31.3, followed by Nichols with a 30.75 and Douglas with a 30.3. Key opened up the rotation on vault, showing a clean Yurchenko double for a 14.9. Biles rocked her amanar vault with just the tiniest of hops for an incredible 9.7 execution score and a 16.0. Raisman followed her on beam. After an almost perfect routine in warmups, she had a few wobbles but stuck her incredibly difficult Patterson dismount to earn a 15.1. Ross came back after her bar routine with a beautiful beam routine with one major wobble on her side aerial for a 14.55. Douglas continued onto floor where she got the crowd clapping along with her upbeat music and hit all her leaps, turns and tumbling for a 15.0. Nichols continued on her fantastic day with a solid, beautiful beam routine scoring a 14.45. Sabrina Vega showed off on floor in her first meet back since 2011, competing a more simple routine, but doing it very well until the last pass when she put her hands down. 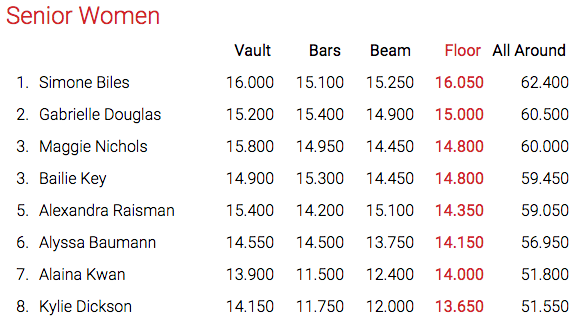 The third rotation ended with Biles in first with a 47.3, Douglas with a 45.3 and Nichols just behind with a 45.2. 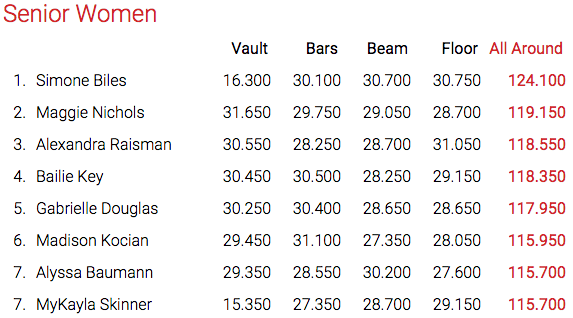 Entering the last rotation, Raisman was five tenths behind Nichols and six behind Douglas as they moved to her best event. However, with Douglas on vault, it seemed unlikely she would be able to catch her. Madison Kocian performed a beautifully flowing bar routine, scoring the highest bars score of the night, a 15.6. Biles finished on bars, where she has greatly improved and ends with a stick to put an exclamation point on her very successful competition. She earned a 15.1 to cap off her night. Raisman took the floor to a roaring crowd, but fell on her newly upgraded second pass. She went on to wow with everything else, but her was not enough to make the podium. Nichols came out strong on floor, scoring a 14.8. Key finished her night with a great bar set, scoring a 15.3 and just missing the bronze. In many ways, the Secret US Classics can be one of the most exciting meets of the year. It is the time when we see impressive upgrades, gymnast debuts and begin to really get an idea of the overall picture for the US women’s team. It is also a meet where anything can happen, as the girls routines are not yet polished and perfected. This year boasts an extra level of excitement with the return of many beloved gymnasts, upgrades in unexpected places and the place in the Olympic cycle where gymnastics fans can begin to see glimpses of next year’s Olympic team. “The energy in the arena was intense,” said gymnastics photographer Christy Linder. Gone were the smiles and casual jokes, instead the girls had stoic, focused expressions. And while it is still early in the lead up to the selection of the world and ultimately the Olympic team, the intensity of the competition is beginning to show. With just over a year to go, everyone has Rio on their mind. And Raisman is not alone. In 2012 the USA seemed like an amanar factory. However, the number of gymnasts performing this high scoring vault consistently has diminished to just one – Simone Biles. Returning gymnasts Gabby Douglas, Raisman and Brenna Dowell all competed the amanar previously. Bailie Key is also training this vault. But the only person to actually show it in podium training today was Maggie Nichols. Welcome to the amanar club Maggie! Speaking of Simone Biles, though she already has the most difficulty in the world by far, she is always pushing herself for more. Biles showed off two new skills on beam. “I added a Barani on beam [front tuck with a half twist] and a front pike… and then I got a new floor routine, so I am excited about that… and then I was supposed to compete a Cheng on vault, but that’s not going to happen, so hopefully for P&G’s,” said Biles in her post podium training interview. Biles also added a full twisting double layout on floor at Jesolo earlier this year and will be competing that along with a brand new floor routine. Bailie Key will not let her US senior debut come and go without upgrades of her own. “Training has been going really well. I am excited to compete here as a senior at the Secret Classic, and I thought training here, podium training, went really good too. I am most excited for floor because that is my big upgrade. I am putting a double layout in and moving my other passes back,” said Key. Along with her upgrade, Key also brings a brand new floor routine of her own. Gabby Douglas is excited to be competing again, but will wait to unveil her new upgrades until P&G National Championships. “I’ve been working on a little bit of upgrades, which you guys will see at P&G’s, and being consistent and patient,” said Douglas after podium training. She knows that to make another Olympic team, she is going to have to give it her all. “We have so many good girls, all fighting for that spot and the competition is more dynamic… all the gymnasts, especially me, are going to have to pull out the best of the best. Especially with Simone. We’re gonna all have to bring out our best skills.” Douglas gave us a preview, showing off her new floor routine. In addition to the upgrade frenzy were a number of familiar faces making their way back into the elite scene. 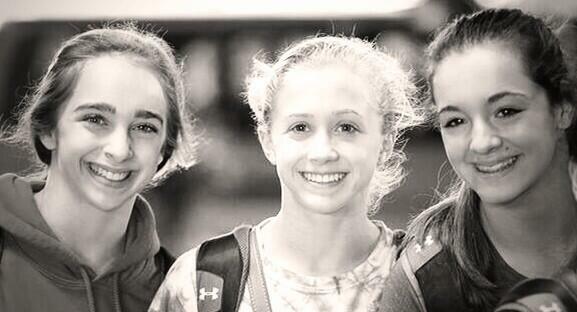 Brenna Dowell, Polina Shchennikova and Sabrina Vega are all returning to elite gymnastics. Dowell just took a short hiatus to try her hand at college gymnastics. After a successful freshman year, she showed up to podium training looking better than ever on bars. Shchennikova showed off her gorgeous lines and flexibility on beam and bars, reminding everyone why she has been one that always catches your eye. Vega has been out since the 2012 Olympic Trials and is looking to begin her journey back into competition this weekend. 2014 World Champions MyKayla Skinner, Alyssa Baumann, Ashton Locklear and Madison Kocian are all out to prove that they are still in the running this year, even with the return of so many other gymnasts. Kocian and Locklear are both coming off of injuries as well, and will be looking to show that they are fit and ready to go. Standout junior Nia Dennis will be making her senior debut, looking to make a place for herself as well. All in all, the gymnasts everyone expected to look great, do. And the gymnasts we have been wondering about- look great as well. This year, more than any before, seems to be an embarrassment of riches. Let the fun begin. USA Gymnastics opens up it’s elite season with the annual City of Jesolo Trophy in Italy. The seniors they are sending are as diverse in their situations as they are in their gymnastics strengths. From reigning world champions to returning Olympians to first time debuters, we will see the gamut in Jesolo. Gymnastike is on the scene, and providing as many routines as possible from the training sessions in Jesolo, which you can access with a Gymnastike Gold subscription. These videos provide a look into the training sessions for the meet. Simone Biles comes into the competition fresh off of her dominating win at the AT&T American Cup just a few weeks ago. She also comes in as the reigning two time world champion, and for now, is considered unbeatable. Joining her are three other members of the 2015 World Champion Team, Kyla Ross, Alyssa Bauman and alternate Maddie Desch. Ross declined her place at the AT&T American Cup to have more time to work on upgrades. So this is the first opportunity to see the fruits of her labor. All three will be looking to prove that they are still in the mix for this year’s worlds team despite the new competition. Simone Biles looks as great as she looked just a few weeks ago at the American Cup. Her vault is dreamlike, her bars are solid and even better connected than in training for the American Cup. She had a few minor wobbles on beam, but was steady and confident and floor continues to be her playground as she stuck a double layout fullout with ease. Kyla Ross brought some upgrades to Jesolo on bars. She has not showcased the pak full that she had mentioned training earlier this year, but did bring in a new combination and a new dismount. The routine: toe on + toe full + Maloney + Pak + van Leeuwen (form break here), toe half + jaeger, double front dismount. Ross also brought in a dramatic and creative new floor routine. She continues to grow in her artistry on this event. She did not show the whip to double arabian, but had solid tumbling and dance throughout. Beam and floor are both as solid and beautiful as last year. Alyssa Baumann will be looking to make a statement that her beam routines are what the USA needs, and that she can contribute on any event. And her training in Jesolo definitely helped to make her case. On floor she showcased three difficult turns- a Memmel, a double L turn and a quadruple turn as well as a piked full out. Her beam looks beautiful, and she does one of the most solid, upright standing arabians in the world (second only to Nia Dennis). The routine: arabian, switch ring, backhandpring step out + layout step out, switch split + switch half, full turn, front aerial, sheep jump, onodi + wolf jump, aerial, roundoff double pike dismount. 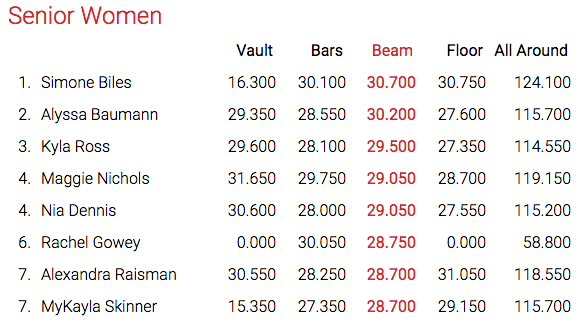 Baumann completes the package of being able to represent the US on any event with a solid double twisting yurchenko on vault and a beautiful bar routine. Maddie Desch put in solid training sessions, however she needs cleanup work on all of her events. She threw a solid DTY on vault, however landed with quite a low chest and without the flight dynamics of many of the other US gymnasts. Desch puts together quite an impressive bar routine, but will need to clean up some form issues and landing on her dismount. The same is true on beam. Desch has some great skills, but needs to work on amplitude. All in all, Desch looks solidly like she belongs in Jesolo, but will need to continue sharpening her skills and performance as the year goes on. Bailie Key is not stranger to the international elite scene, making her fourth appearance at the City of Jesolo Trophy. She comes into Jesolo as the reigning junior all-around champion for two years running. Key was injured and did not take part in the junior national championships last year, but her resume is long and distinguished. Her senior debut has been widely anticipated, and Key will be expected to be a major player for the podium this year. Key is competing the same delightful floor routine from last year, and she has added a double wolf turn. Tumbling upgrades are also expected but were not shown in the training videos. She brings the same strong, consistent beam routine as last year though re-worked and with a wolf full turn. Its on uneven bars that Key shows the most upgrades adding a Ricna + pak combination and a Chow + overshoot to handstand + stalder 1/1 + Ray. Her bars have beautiful flow and form with just a slight form break on her new low bar work. Her DTY on vault showed a lot more form issues than she used to have, but it was just one vault. Emily Schild is actually a second year senior, but injury kept her out last year so this will be her senior debut. Schild showed a lot of promise at the 2013 Nastia Liukin Cup, but has never quite put it all together due to injuries and mishaps. She will be looking to give a solid performance in Jesolo. 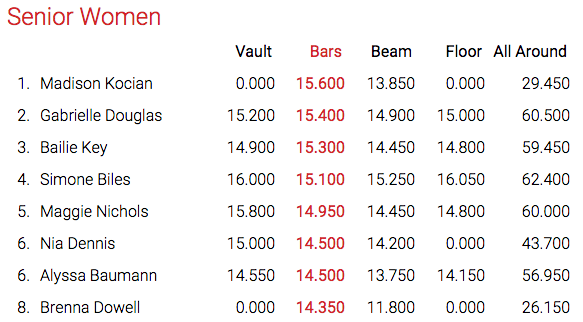 There were no training videos of Schild on vault, which has been her strongest event in the past. She showed a pretty and well done floor routine in training, but depending on the tumbling passes may be lower in difficulty than many of her US teammates. Her beam routine was clean, showing off her beautiful lines, but had some major form breaks in her back tumbling. Schild has gorgeous lines and a great swing on bars, with lots of great inbar work. However, a number of form breaks keep it from being really solid, but her full twisting double layout dismount is fabulous! Megan Skaggs is another first year senior, and this will also be her first international assignment. She has a quick and expressive floor routine to some exotic music that is fun to watch. 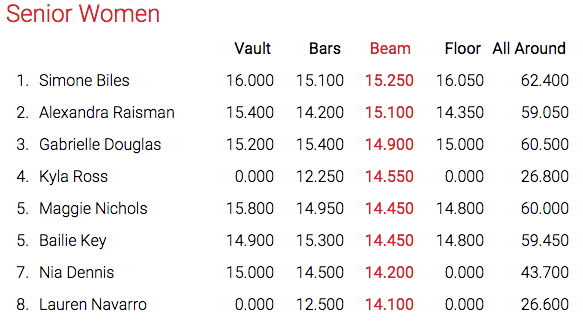 On both beam and bars, Skaggs has a lot of potential with difficult skills and pretty lines. However, she needs to do clean up on a lot of wobbles and form breaks. She pulled around a DTY that landed quite low. Last but not least is Maggie Nichols, who missed out on last years world team selection camp and worlds due to injury after making a name for herself at the 2014 US competitions. Nichols has a great floor routine with a lot of energy and expression, including a piked fullin and a triple turn. She has a nice beam routine with a piked front tuck with a half and a switch ring. She had the cleanest DTY next to Ross. And where Nichols really makes a statement is on bars. She brings in seven connected skills! Toe 1/1 + Chow + pak + Maloney + overshoot to handstand + toe 1/2 + van Leeuwen. Nichols will be one to watch. These ten world class seniors are all showing great consistency in training. While the gold is likely wrapped up, it will definitely be a battle for the other two spots on the podium. Winning, not just trophies, but helping to position them for selection to a much bigger international competition later this year. Photo from Simone Biles Twitter. The final U.S. women’s gymnastics assignment for the spring has been made.Yesterday, USA Gymnastics announced that Maggie Nichols will be competing at the 2014 Tokyo World Cup. This is the third (and final) international assignment the US has made for this spring. Peyton Ernst, Kyla Ross and Maggie Nichols on the podium in at the City of Jesolo. Nichols, a second year senior, has represented the USA internationally three times in 2013 (including an exhibition) and once this year. She had a great competition last weekend at the City of Jesolo meet, coming in third in the all-around behind two U.S. teammates. More importantly, she showed consistent, solid routines on every event. She performed a dynamic, entertaining routine on floor, placing third in qualifications (but did not advance to event finals due to the two per country rule) and showed a great beam set as well. Nichols replaced Peyton Ernst who was the nominative gymnast for the competition and who represented the USA at the Tokyo World Cup in 2013. This comes as no surprise, as USA Gymnastics had announced earlier in the month that the final decisions would not be made until after the City of Jesolo Trophy meet. Ernst is the second alternate for the team representing the U.S. at the Pacific Rim Championship behind Brenna Dowell. Peyton Ernst, Bailie Key and Maggie Nichols. Photo from Maggie Nichols Twitter. The Tokyo World Cup is the final meet of the 2013-14 International Gymnastics Federation World Cup all-around series. It will be held at the Tokyo Metropolitan Gymnasium April 5, 2014. Many of the same competitors seen at the 2014 AT&T American Cup, the most recent meet held on American soil in the series, are expected to compete. They include 2006 World all-around champion Vanessa Ferrari of Italy, Victoria Moors of Canada, Carlotta Ferlito of Italy, and Roxana Popa of Spain. Asuka Teramoto of Japan, the defending champion, is also expected to be there.